Sunanda Pushkar’s shocking and ‘unnatural’ demise has brought Union minister Shashi Tharoor’s political career under the scanner, and with no leniency being shown by the Congress party, it seems the flamboyant MP will have to fight his own battle, reports Renu Mittal. A Pandora’s box of possibilities is out in the open after a team of three All India Institute of Medical Sciences doctors said Sunanda Pushkar’s death was “sudden and unnatural” after conducting the post mortem on the 52-year-old wife of Union minister Shashi Tharoor, who was found dead in mysterious circumstances at a five star hotel in Delhi on Friday evening. The detailed report of the post mortem would be available after a few days, said the doctors, even as they have ruled out poisoning but have admitted there are injury marks on her body. The doctors have refused to elaborate on these injury marks nor detailed whether they are recent or of days gone by. 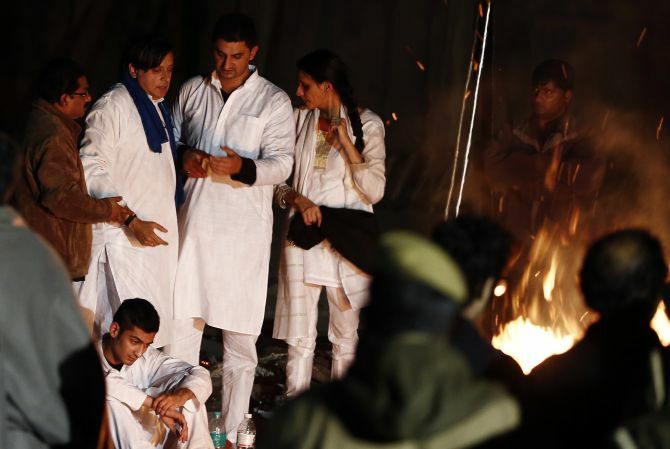 Image: Union Minister Shashi Tharoor gestures after performing the last rites for his wife Sunanda Puskhar at a cremation ground in New Delhi on Saturday. 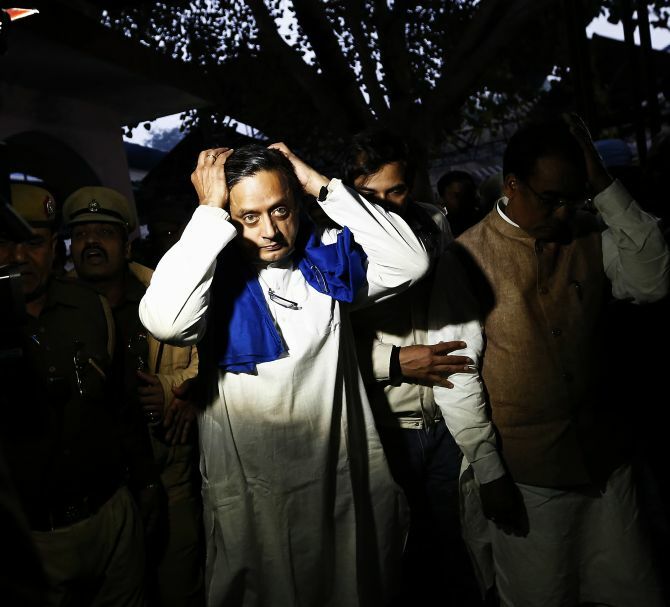 Even as Sunanda Pushkar was cremated on Saturday evening, the death of the minister’s wife, a known socialite, has hit international headlines even as it has put the political future of Tharoor, the MP from Thiruvananthapuram, under a scanner. Tharoor, known to be close to Prime Minister Manmohan Singh and seen to be a pro-American in the Union Cabinet, was dropped after a cricketing scandal hit him and his then friend Pushkar. But after a gap, the prime minister again brought him back into his council of ministers, this time as a Minister of State in the Human Resources and Development Ministry. While there has been silence from most Congress quarters after the sudden and dramatic death of Sunanda Pushkar, the prime minister did call him just an hour after her death was reported and offered his condolences. While Kerala leaders are apprehensive that the entire issue would affect the party in the state, especially with the opposition Communist Party of India-Marxist demanding a full inquiry, sources say that Shashi Tharoor may have to step down unless the Delhi Police can conclusively prove that Sunanda died because of an overdose of sleeping pills, the medicine which she was taking and alcohol or alternatively that she committed suicide. Otherwise, with Congress fighting the upcoming Lok Sabha elections amid charges of corruption and scams, party vice president Rahul Gandhi may need to prove probity and transparency as far as the minister is concerned. Sunanda Pushkar, who was Tharoor’s third wife, had just returned from Kerala where she was diagnosed with LUPUS, an illness where the body refuses to recognise its own tissues which bind various organs together and which needs steroids and heavy drugs for the impact to slow down. On top of that she told a channel that she had TB of the stomach. A staff member said for the last two days she had not eaten but was only smoking, drinking alcohol and was taking sleeping pills. Hotel sources say that the CCTV camera on the floor where the Tharoors were staying was not working though there are unconfirmed reports that an unidentified man -- who reportedly does not work at the hotel -- did visit her suite to give her food. 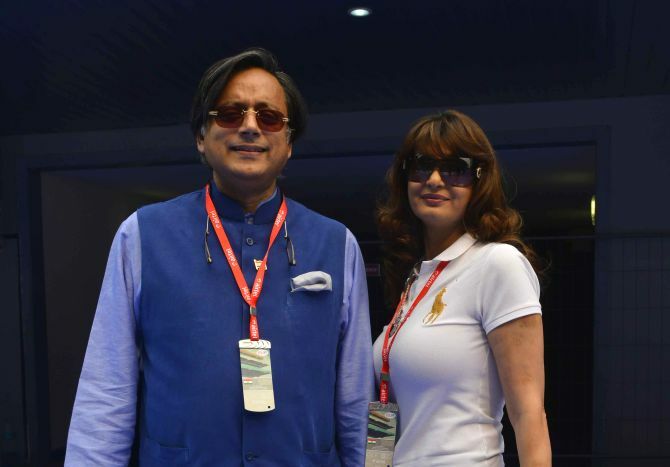 It is learnt that after returning from Kerala, Sunanda told select journalists that she was going to divorce Tharoor as he was having an affair with a Pakistani journalist. She used a lot of abusive language against him and reports are that the two were in a fight on the flight back from Kerala as well as in the Leela hotel lobby. She moved into the hotel a day before Tharoor did. Tharoor was at the All India Congress Committee meeting at Delhi’s Talkatora stadium the entire day on Friday and returned to the hotel only in the evening and when he went into the bedroom after 8 pm he found her dead on the bed. With the police scheduled to question him late on Saturday, a lot of issues are expected to become clear but it is more than certain that the couple were on bitter terms and had forged a public temporary patch up because of his approaching elections and political career. Sources who know Sunanda say she was apprehensive that Tharoor would divorce her after the elections and was more sounding like a woman who had been dumped. For both Tharoor and Pushkar it was their third marriage, and sources close to Tharoor saidhe did begin to say he had made the biggest mistake of his life by marrying her. 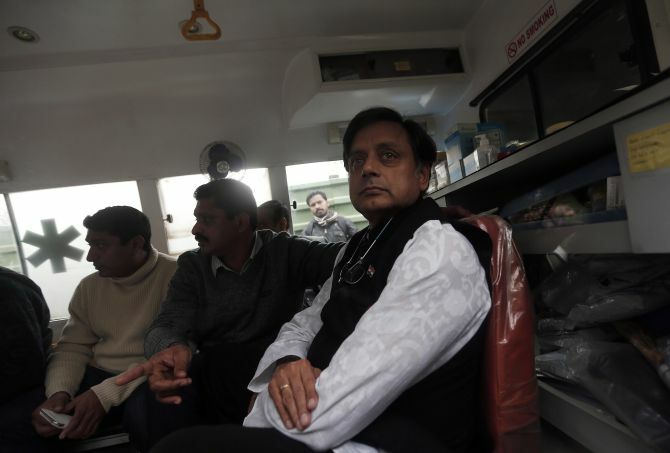 The popular Shashi Tharoor, who had at one point more followers on Twitter than Narendra Modi, appears to be in big trouble with the Congress leadership in no mood to show leniency to the flamboyant minister who would have to fight his own battle to save himself.